North Harris has an extensive network of paths and tracks which is unique in the Western Isles where there are otherwise few well established paths. Many of the paths were established long ago as routes between townships, and some were then upgraded for use as stalking paths when North Harris was run as a Victorian shooting estate. The Urgha to Reinigeadal path was the main route between Reinigeadal and Tarbert until 1989 when a road following a different route was finally built. This steep undulating path was the route taken by generations of Reinigeadal postmen several times a week! In recent decades several paths have been neglected, with drains becoming blocked and parts of paths becoming eroded or overgrown. However, since the North Harris Trust was formed, path restoration has been a priority, as maintaining the path infrastructure is a key element in promoting the enjoyment of the landscape and natural heritage of the area. There have been major works on the Reinigeadal to Urgha path involving clearing blocked culverts, installing water bars and cross drains, surface repairs and re-building or repairing bridges. Similar work has been carried out on the Bogha Glas to Gleann Langadal path and a new bridge was installed across the Abhainn Langadal where the previous bridge had been washed away as the river changed course. This replacement bridge was itself washed away in a flash flood in summer 2012. We are currently looking into installing another bridge which will be placed further upstream to avoid this happening again. 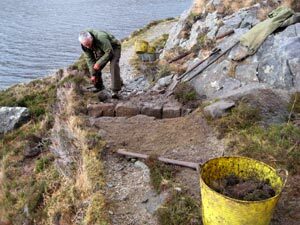 Repair and restoration work has also been completed on the Loch Chliostair to Gleann Ulladal path, and the Urgha to Maraig path. Work continues on the remote Miavaig to Bogha Glass path. 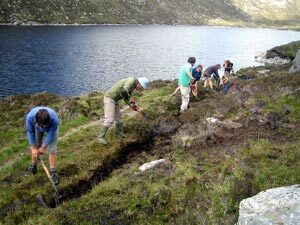 In addition to professional path work, volunteer work parties from the John Muir Trust and Harris Stalking Club have carried out much-needed maintenance work, clearing blocked culverts and opening drainage ditches on the Maraig to Urgha, and Gleann Leosaid paths. In order to find out the level of path use, we recently installed radio-beam people counters on the estate. These will help inform where paths work should be prioritised in the future. In order to allow more people to enjoy our paths network, the Trust has extended the parking areas at the start of paths at Urgha, Maraig, and Miavaig.